Geology of the White Tank Mountains, Central Arizona. The White Tank Mountains are a moderate sized (4,000 ft) mountain range about 25 miles west of Phoenix, Arizona. The range is one of several metamorphic core complexes in central Arizona. Over the last two years we have been investigating both the Bedrock and Quaternary Geology of the range. These web pages are a summation of the work we have done in the range and a description of the work currently in progress. True color Landsat image looking west from above the city of Phoenix at the White Tank Mountains. 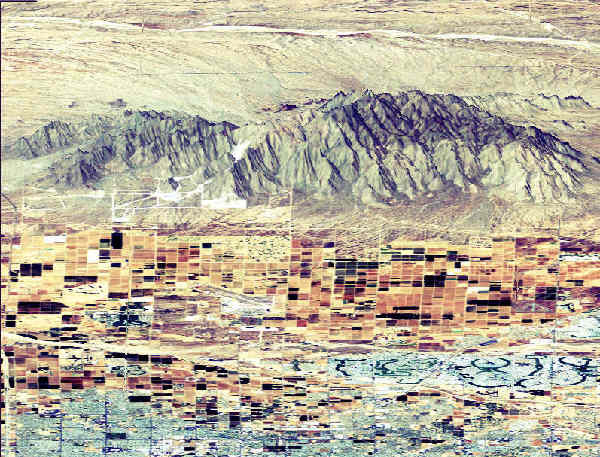 In the foreground are the agricultural areas (the green and brown checkerboard areas) on the outskirts of phoenix. Sun city is the white area with green strips (golf courses). Two major types of rocks are found in the mountain range; 1.7-1.6 billion years old proterozoic metamorphic rocks (which appear dark on the top and in the southern part of the range) and a Tertiary or Cretaceous age granitic intrusion (which is lighter colored on the image).